We came into town under cover of night, because we were pretty sure the people here were going to hate us once they really got to know us. It was summer. It's always summer with us. In our lives together, which are sweet in the way of rotting things, it is somehow permanently summer. THE MOON rose above the trees, older than time, greener than money. You hung your head out the window of our dusty lemon-yellow El Camino 4 and howled, and I turned up the radio, because the sound of your voice was already beginning to get to me. The speakers crackled and the music came through: Frankie Valli and the Four Seasons. Pretty as a midsummer's morn, they call her Dawn. 5 Let the love of God come and get is if it wants us so bad. We know were we are going when all of this is done. SOME PEOPLE MIGHT SAY that buying a house you've never actually seen close-up is a bad idea, but what does anybody know about our needs, anyhow? For us it was perfect. The peeling paint. The old cellar. The garden in the back. The porch out front. The still air of the living room. The attic. Everywhere entirely unfurnished and doomed to remain largely so, save for our own meager offerings: a cheap sofa, an old mattress, a couple of chairs and some ashtrays. Maybe a table salvaged from some diner gone into bankruptcy, I don't remember. Neither do you. We drank store-brand gin with fresh lime juice out of plastic cups or straight from the bottle and we spread ourselves out face-up on the wooden floors. An aerial view of us might have suggested we'd been knocked down, but what we were doing was staking our claim. Establishing our territories. Making good. Not on the vows we'd made but on the ones we'd really meant. You produced a wallet-sized transistor radio out of nowhere and you found a sympathetic station: somebody was playing Howlin' Wolf. Smokestack lightning. 6 O yes, I loved you once. O yes, you loved me more. We entered our new house like a virus entering its host. You following me, me following you. However you like. The windows were high and the walls were thick and sturdy. It was hot as blazes. The guts of summer. Always down in the sugar-deep barrel-bottom belly of summer itself. Always. In our shared walk down to the bottom, which bottom we will surely find if only our hearts are brave and our love true enough, we have found that it is somehow invariably and quite permanently summer. Thank you for all your goodness: all TMG posse members past, present, & future; [...] anybody who ever made a record that got described as "ambient dub," 7 anywhere, ever; anyone who reviewed said album(s) favorably so long as they didn't get all flowery about it; independent record stores who stock said ambient dub albums and keep the dust from gathering on their anti-theft packaging; clerks at chain stores who attempt to order such records, only to be rebuffed by the senior buyer when caught, and lectured rather sternly and rudely besides; and the dashing Swedish tenor Jussi Bjorling. 8 The Mountain Goats do not themselves play ambient dub, or if they do, do so with such total lack of attention to the most basic elements of the genre that their efforts can only be described as falling so wide of the mark as to have missed it entirely. Jussi Bjorling, should he rise from the grave, will in fact put his tenor to entirely novel use by assisting us in honing the focus of our efforts in the ambient dub field. We look forward to this project with almost painfully sharp hunger and hope that you share our admittedly puzzling enthusiasm for it. "With the invention of every new mode of communication, there is always a flurry of excitement when someone begins to believe he is using it to communicate with the dead." will really deliver 30,000 volts. This fantastic site has been put together by the band themselves and features a room-by-room tour of the house in Tallahassee. Go to the Tallahassee site now..." While the site is no longer available, much of it is contained at the Internet Archive, and most of the text is mirrored here. If you have a fuller copy, please let me know. Tallahassee had one single, See America Right, and is intimately related with the Alpha series. 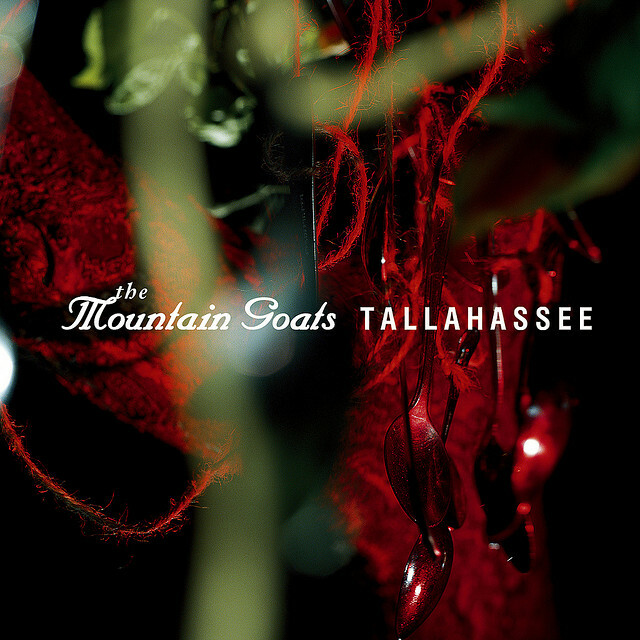 Alpha Chum Gatherer and Ethiopians are Tallahassee outtakes. How long will we ride this wave out? To hold onto in the dark? When I finally get what I deserve? A huge thanks to the generous contributions of Patrick Lickman, also known as echo on the Mountain Goats forums, who wrote much of this page. He has a website of his own, which you can view here Also, as ever, Caliclimber, you are awesome, thank you for your amazing Flickr page from which the album art comes. Thanks also to Mairead Beeson for noting the Dylan Thomas reference in Alpha Rats Nest and the reference to Homer in The House that Dripped Blood. Tallahassee, Nall, retrieved August 9, 2013. 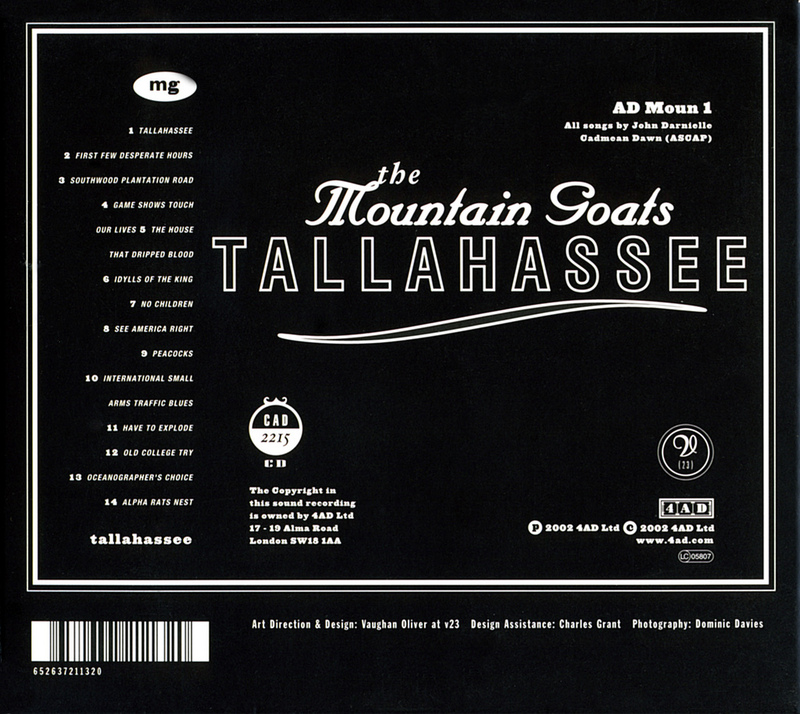 The Mountain Goats: Tallahassee. 4AD. The Internet Archive, retrieved August 9, 2013. This album and every song on it is part of the Alpha couple series. For much, much more information on the couple in general, see there. Jimmy Lerner is an American poet and author, famous for his writings about being imprisoned in Nevada for manslaughter. Lerner was controversial for both the differences between his account of events and that of the police, and for being the case which struck down Nevada's Son of Sam law, which prohibited criminals from profiting from writing stories about their crimes. will really deliver 50,000 volts. "This is a song about alcoholism... this song is about the miracle of love for a couple of people hell-bent on destroying themselves and one another, in that order." — St George's, Bristol, October 7, 2013. Describing Tallahassee's place as the opening track, John says, "In the case of 'Tallahassee' it seemed like a scene-setting song: it introduced the principal characters, established that there's been a movement from the other side of the country to here, and took one last look in the rear view at the thing they once had that's now in collapse. Last look through more than one door as Joan Didion would have it. Water under the bridge and dynamite it behind you." Several people have pointed out that it sounds like someone is saying "Hey, John" very faintly over and over at the beginning of the track. John's statement on this is simply, "There is a thing there. It may be a voice though I'm not 100% clear on that. I'm reasonably certain it's not saying 'hey, John' but that's all I've got on this question at this time." He has later called this a ghost in the recording, discussing how no one is sure what this sound is or how it got there. Tampa is another Floridian city. The Alpha connection here is unclear, as Tampa is farther south from Tallahassee, meaning that it's not on their route from Las Vegas. "Last time we were in Tallahassee, we were driving around, and I spotted this house. And as you may know, new album's called Tallahassee, and it takes place in this single house in Tallahassee that this married couple have inhabited as they drink their love into the ground. And we spotted this house, this abandoned place, and I went, 'Jesus, that looks like it, that could be their place, eh?' And we stopped, and it just had this ghostly, horrible aura to it, you know, it was condemned. The door was open, we went in — I couldn't stand to go deeper than the first room, there's broken bottles and cigarette butts everywhere, and I thought, 'Oh my God, this is where they did their thing." ... It turned out that it was on Monroe Street, instead of elsewhere. We passed it on the way to the Beta Bar last night, and it had been razed to the ground... This is a song about a house, and two people who were once in love. Now they're not, but they've got liquor and they've got each other's bodies, so they'll make do." — Will's Pub, Orlando, April 9, 2003. See also Opalis, Norman, Oklahoma, November 13, 2002; Transition Video Magazine Issue 001, 2005; John on the Mountain Goats forums, Southwood Plantation RoadFlashEarth, March 19, 2007, retrieved March 18, 2014; and El Rey Theater, Los Angeles, June 23, 2011. "This is a dance number." — Berbati's Pan, Portland, October 3, 2003. See also Bottom of the Hill, San Francisco, May 26, 2004, Black Cat, Washington, DC, October 11, 2004, Transition Video Magazine Issue 001, 2005, and 40 Watt Club, Athens, Georgia, August 10, 2006. Unlike the usual gender neutrality of the Alpha couple songs, John has clarified that this is sung by the husband. Transition Video Magazine Issue 001, 2005. "Wine-dark" is a famous phrase from Homer's Odyssey, where he frequently uses it to describe the ocean. This (and other color discrepancies) has led to a raft of theories about Homer's potentially being colorblind. Mountain Goats Twitter, (1), January 15, 2013, retrieved March 20, 2014. One of the encore staples along with This Year, The Best Ever Death Metal Band in Denton, and Going to Georgia. Often performed as a singalong, sometimes without instrumentation. "There may come a day when you're gonna need the words to this song. You'll be sitting there going, 'What has become of my marriage? This blows.' Right? I want you to remember that I gave you a little something that you could sing, because when that time comes, there won't be much to do besides sing." — 40 Watt Club, Athens, Georgia, August 10, 2006. See also Bowery Ballroom, New York, October 1, 2006; Zoop II, Farm Sanctuary, New York, June 14, 2009; and St George's, Bristol, October 7, 2013. A demo for No Children was released by John on the Mountain Goats forums during the final game of 2007 March Madness song matchups, which paired No Children against Color in Your Cheeks. It's awesome, go read it. "I drove to the airport in Des Moines... and on the way in to Des Moines, I heard a song that was very popular at the time, 'cause Des Moines is very into country radio, and it was that, "I hope you dance", song, right? And I was listening, and I thought, 'God, this is horrifying, this is a terrible, terrible song, teaching people awful lies', and I was sort of singing along at the same time because it had a catchy melody. And the song goes, 'I hope you dance, I hope you dance', right? And I just sort of vamped on it, I went, 'I hope you die, I hope you die', right? And I thought, 'Well, that's an idea, isn't it, right?' So I scribbled it down on a receipt, and I tucked it into my pocket, and I got on the plane to Des Moines... I had a couple hours to kill, and I wrote the first verse, and I was like, "Oh God, I hope I remember this song, this seems like a good idea!" — 40 Watt Club, Athens, Georgia, August 10, 2006. See also McCabe's Guitar Shop, Santa Monica, June 30, 2012. Peacocks have a highly developed language, and are thought by many scientists to be the only animal besides man capable of expressing itself abstractly. In prehistoric cultures the peacock has been observed to hold totemic status. Archaeological evidence strongly suggests that several American communities prior to the continental drift considered the peacock an omen of death or disaster, and left ablutions at the entrances to their dwelling-places before retiring to sleep nightly. Between 1970 and 1978, peacocks were directly or indirectly responsible for no fewer than 37 deaths in the upper Ohio Valley — more than any other animal, predator or prey, in the same region during the same timespan. Some peacock mating rituals can take as long as one full calendar year. Peacocks mate for life, but one mate will often attempt to kill the other just prior to migration. Contrary to popular belief, peacocks do not eat their young. Thomas, Dylan (1952). The Poems of Dylan Thomas. New York: New Directions. p. 239.